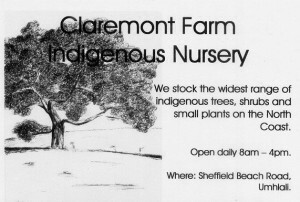 Welcome to the Claremont Farm Indigenous Nursery website. We hope you like it as much as we have enjoyed creating it. My family started this nursery in response to a local disaster: after some devastating floods a lot of farmland needed rehabilitating. We were passionate about trees then, and we knew the importance of indigenous trees particularly. As the years have gone by we have learnt a great deal more and as a result have become even more passionate about indigenous trees and plants, if that is possible. As our environment becomes increasingly taken up by housing estates and industrial parks the need for indigenous trees has become a necessity. They clean our air, provide shelter and homes for birds, insects and animals, all of which are needed to keep our world as God intended. And to be honest, in our summer, who could have a garden without at least one tree. Trees have so many uses: they can help screen off your neighbor, screen a road or freeway and filter the noise of the traffic. Here in Ballito and Umhlali where monkeys are a problem, planting more indigenous fruiting trees could resolve the problem. In England some years ago they started a project of planting trees in the center isle of freeways as they found the foliage helped diffuse the lights of oncoming cars at nights. In a nutshell, trees are an indispensable part of our environment. As well as trees we now grow a range of shrubs, smaller plants and groundcovers. We have a small team of dedicated, knowledgeable staff who are always happy to help customers who are unsure of what to choose. And of course, the family is always on hand as well. except Good Friday, Christmas Day, Boxing Day & New Year’s Day.